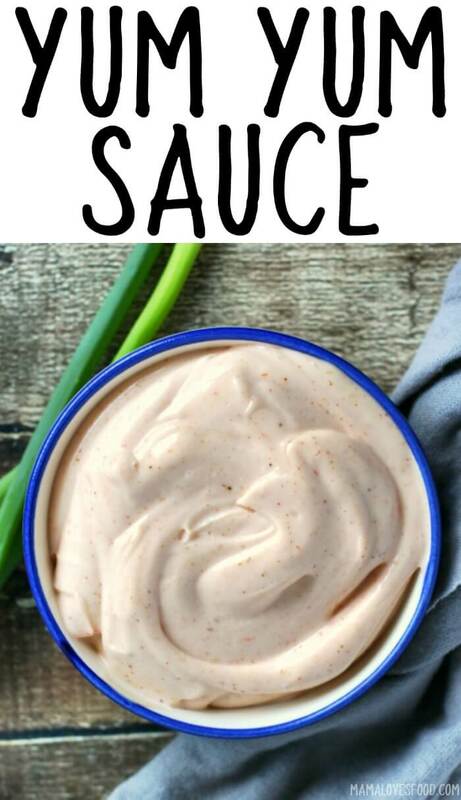 Yum Yum Sauce is a delicious savory white sauce made with ONLY FIVE INGREDIENTS. I bet you already have all the ingredients! 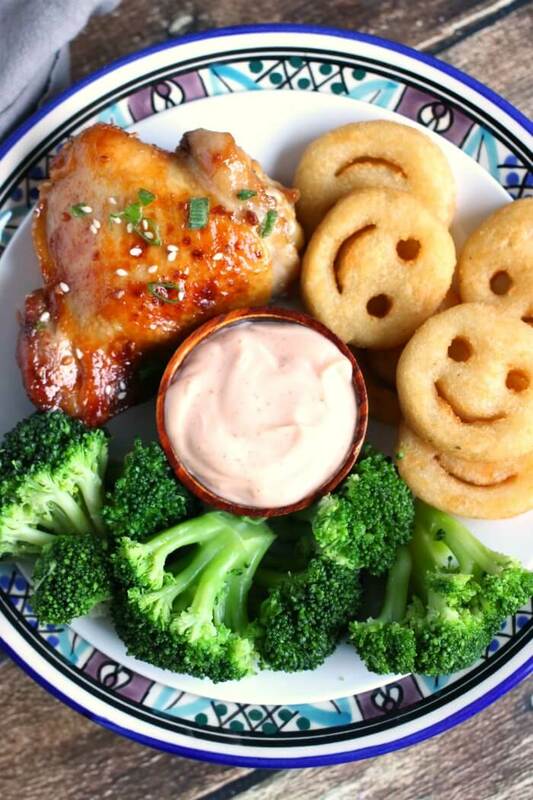 I suggest serving your homemade Yum Yum Sauce with teriyaki chicken, fried rice, and lemon cookies for dessert! Yum yum sauce is a mild savory dipping sauce typically found at Japanese steak houses. Our version is only 5 ingredients and takes about 30 seconds to whip together! It goes especially well with Asian inspired foods like fried rice and teriyaki chicken, but is also delicious on American foods like french fries and potato wedges! 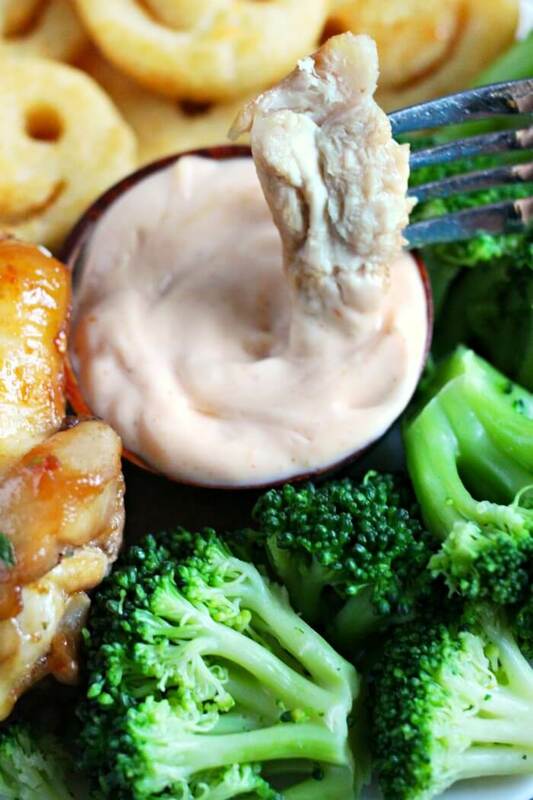 Yum yum sauce is also called White Sauce, Sakura Sauce, or Japanese Steakhouse Shrimp Sauce. In our family we also refer to it as Hibachi Sauce or Hibachi Dip. White sauce is usually found at a Japanese restaurant like steakhouses and hibachi restaurants, you can also often find it in sushi restaurants. Mayonnaise – You’ll want to use a full fat mayonnaise for the truest flavor. This is meant to be a very rich sauce. Butter – Make sure your butter is very soft or even melted, but not hot. If you start with butter that is too firm you will end up with butter chunks in the sauce. Ketchup – I know I’m going to get the side eye from several people over this ingredient, but trust me, it works. Most Yum Yum Sauce recipes call for a combination of tomato paste and sugar – this is just a simple shortcut to that same result. Seasoned Salt – You can find seasoned salt on the spice aisle usually on a shelf near the salt and pepper. First add mayonnaise, butter, ketchup, seasoned salt, and paprika to a mixing bowl. Make sure the butter is very soft or melted (but not hot) before adding. Next, mix ingredients together with a whisk or fork, scraping the sides down with a spatula until everything is well incorporated. There’s no need for a food processor, it’s so easy! Finally, add water in small amounts until desired consistency is reached. We prefer a thick white sauce and do not usually add the water. The images in this post do not have water added. 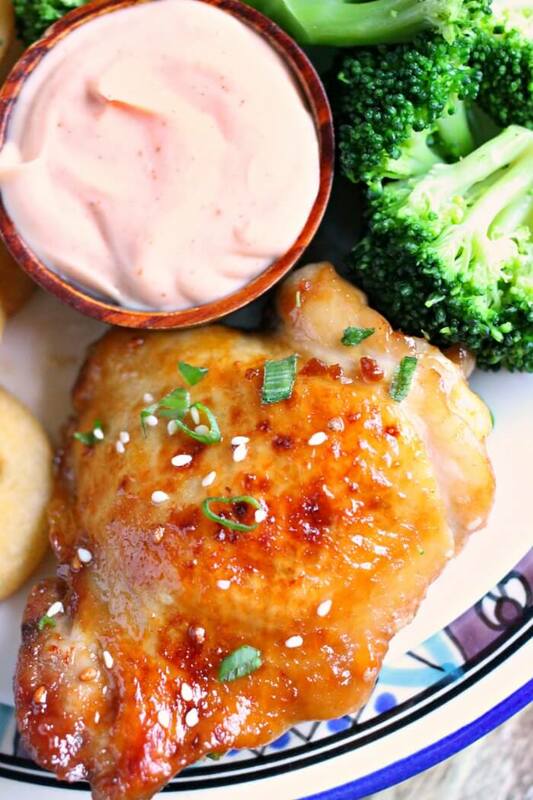 Yum yum sauce is gluten free when made with this recipe. If you purchase Japanese steak sauce at a market or have it at a restaurant, you will want to confirm that the ingredients they have used are also gluten free. We paired our white sauce with teriyaki chicken, a healthy green vegetable (roasted broccoli) and a filling starch (potato wedges). 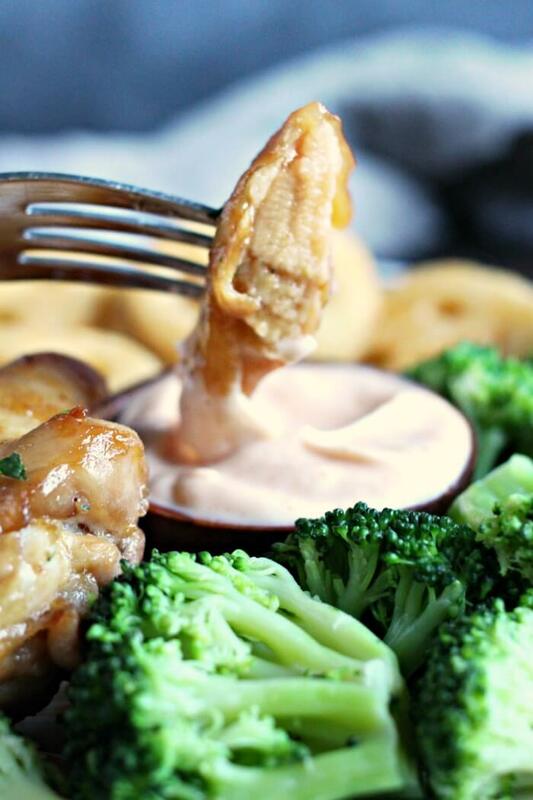 Yum yum sauce goes great with chicken recipes and coconut shrimp! ★ If you like a thinner yum yum sauce, add water slowly at the end until you reach the perfect consistency for your tastes. 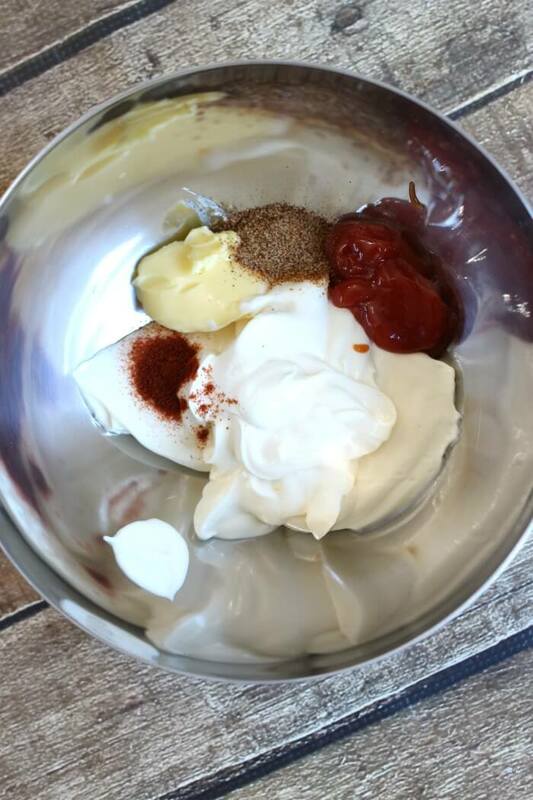 ★ Make sure you don’t try to speed things up by using a blender or electric mixer to put this sauce together, you will risk breaking the mayonnaise emulsion and end up with a very thin liquid. It will still taste good, but the consistency will be very off. ★ If you want to save your yum yum sauce for later, make sure to note the expiration dates on all your ingredients. The one with the soonest expiration date is the one you should refer to for your sauce. Store in sealed container in the refrigerator. ★ Want a little heat? Whisk in a dash of cayenne pepper or some hot sauce! 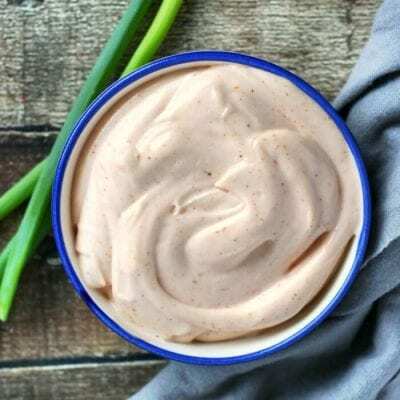 Honey Mustard Recipe – Another simple dipping sauce that whips up in just a few ingredients. I love to use this as a chicken marinade or salad dressing as well. Ranch Dressing – The American version of Japanese white sauce? I think it might be! You’ll never buy from the grocery store again after making our recipe at home. 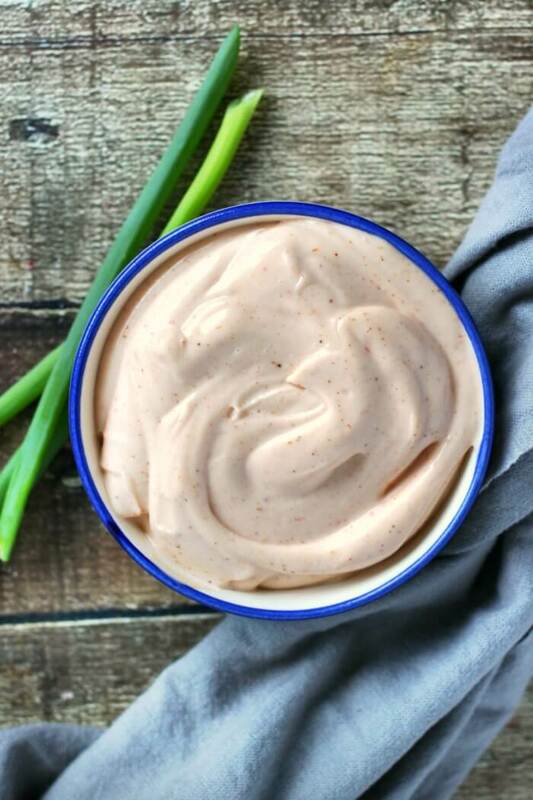 Blue Cheese Dressing – If you like decadent, super chunky blue cheese dressing, you’re going to want this recipe in your life. My daughter and I have been known to eat it by the spoonful. Peanut Sauce – Another Asian inspired favorite! This one’s great as a dip or even over rice noodles like a sauce. Yum! Mixing Bowl – I like a good stainless steel mixing bowl. Nice and sturdy, easy to clean, and won’t break! Whisk – A fork will do in a pinch, but whisks just work so much better. Spatula – Rubber spatulas might be greatest kitchen invention ever. So amazing for making sure you get every little bit of sauce or batter off the sides of your dish! Yum Yum Sauce is a delicious white sauce that is typically found at Japanese steak houses. We have an easy quick version to make at home and dip everything in! Whisk ingredients together and enjoy! (Don’t use a blender or you risk breaking the emulsion. You’ll end up with a liquidy mess. A delicious liquidy mess, but not the result we are looking for!). If sauce is too thick, add water in very small increments until desired consistency is reached. What an easy recipe for a tasty sauce! I can see a lot of chicken and Asian meals coming out of my kitchen in the next few months with a side of this delicious looking sauce. This is my favorite sauce at restaurants! can’t wait to make this at home, thank you!